High atop a mountain in Pennsylvania, the land once stood barren, marred by strip mining, and is now gaining new life. As a wind farm. One of the cleanest, most environmentally friendly energy sources available, wind energy is the fastest-growing source of energy in the world because of its non-polluting and abundant nature. Oh, and it’s free. 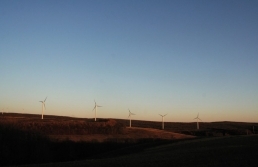 Located near a municipal utility, the Cambria County site generates 62.5 megawatts of electricity with its 25 Nordex N90 turbines. Did you know that about 6 percent of the total land area of the lower 48 states enjoys wind conditions suitable for major wind development? In fact, the electric power that could be produced by that 6 percent of land could produce 150 percent of our country’s current energy consumption. It’s pretty amazing to consider that the site that once supplied coal to power our nation is now providing wind to do the very same thing.